We’ve come back from our first 2012 hafla, Nikki Livermore’s Winter Wonderland, at the almost beautifully refurbished Langdale Hall in Witney; besides the place looking rather nice, I actually missed the stage. I don’t know if it will be replaced so I should like to put it out there that I for one think it’s essential; when Nikki and Helen Sleiman kicked off the evening with a free-for-all warm-up Zumba session, I couldn’t see a thing and I’m not vertically challenged! both ladies were lost in the crowd - bring back that stage!! The hafla itself brought together all the familiar faces and it was great to catch up with everyone. On the programme were among others the various incarnations of the Isisters and Hazzaz groups who invariably jollied the place up and the ladies from Hathor without whom an evening would be incomplete. The lovely Carrie Nicholson made it from Didcot and happily represented the ‘dark fusion’ element providing an excellent foil to the likes of Helen Sleiman who led her Zakoura group in a lovely dynamic modern Egyptian number and later mesmerised everyone with her own solo. There were a few new faces from Cheltenham; the soloist Anne Blagden who from the back bears an uncanny resemblance to Nikki (that’s definitely a compliment) as well as Jane Claridge who closed the show to a Ghawazi number. My apologies to all those I haven’t mentioned; the programme was certainly a full one. 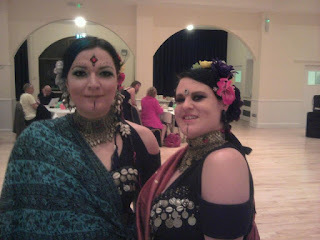 I do however have to round up this article by mentioning the ATS contributors, our ‘sisters in the art’ Sundara who performed 2 lovely dances of one of which incorporated a ‘ripple’ effect which I absolutely loved and our good selves Ashnah who took our Kodo dance to Witney for the first time but minus our lovely Jen..